euthanized. It was the humane thing to do. The Royal Pup had been getting a little slower, although he could still tree Mr. Squirrel and use his smarts to get his best friend Indiana Bones to give up “the good spot” on the couch. Atti ate a little less than normal Monday and Tuesday, but otherwise appeared fine. Wednesday morning he got up and his back legs were not working correctly, so he was rushed to the vet’s office. There, he was diagnosed with massive organ failure, which was soon unfortunately confirmed with a couple of tests. The decision was made to put him to sleep rather than allow things to proceed naturally, which would have been painful and cruel. The little guy was already full-grown when he was rescued from a shelter by a fellow journalist. His exact age is unknown, but he is estimated to have been 16-17 years old. I was fortunate to have been a part of about half of those years. Atticus had captured many hearts with his always-friendly attitude and ever-spirited temperament. He inspired people to make the most of their lives and the lives of the animals around them, filling them with love and the pure joy of being. 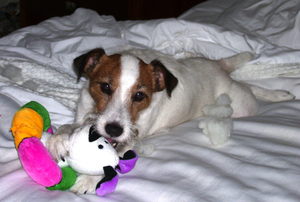 Best known as a little dog in search of big adventure, Atticus had a life well-lived. He will always have a special place in my heart. Aw, I am soooo sorry, Mickie. He was such a good boy. We are so sorry To here this News ! Bless His ROyal Soul. What an awesome guy to share your life with.